MCC was founded with a focused mission to reduce poverty by promoting economic growth. MCC’s model is based on a set of core principles essential for development to take place and for development assistance to be effective—good governance, country ownership, focus on results, and transparency. 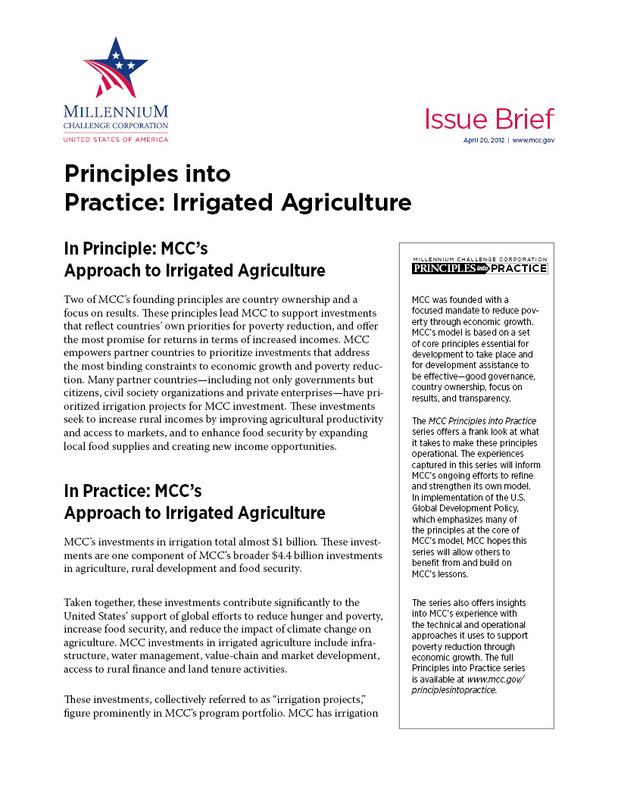 The MCC Principles into Practice series offers a frank look at what it takes to make these principles operational in the projects and activities in which MCC invests. The learning captured in this series will inform MCC’s ongoing efforts to refine and strengthen its own model and development practice. MCC hopes this series will allow others to benefit from and build on MCC’s lessons. This paper explores MCC's experience to-date in designing, implementing, monitoring, and evaluating roads investments around the world. Through its latest Principles into Practice paper, MCC discusses how it has put the principle of transparency into practice and what it has learned about implementing this fundamental tenet of aid effectiveness during its first 10 years of experience. MCC works with a limited number of well-governed poor countries and is the only donor agency in the world to base country selection so heavily—and so transparently—on public, third-party policy performance data. This MCC-USAID collaboration looks at the value, challenges and lessons of doing impact evaluation in the agriculture sector. Gender equality and the empowerment of women and girls are widely recognized as key dimensions of human progress. Most development institutions and partner governments acknowledge this in laws, policies, institutional structures, and programming. Many MCC partner countries have prioritized irrigated agriculture projects to increase rural incomes by improving agricultural productivity and access to markets, and enhance food security by expanding local food supplies and creating new income opportunities. 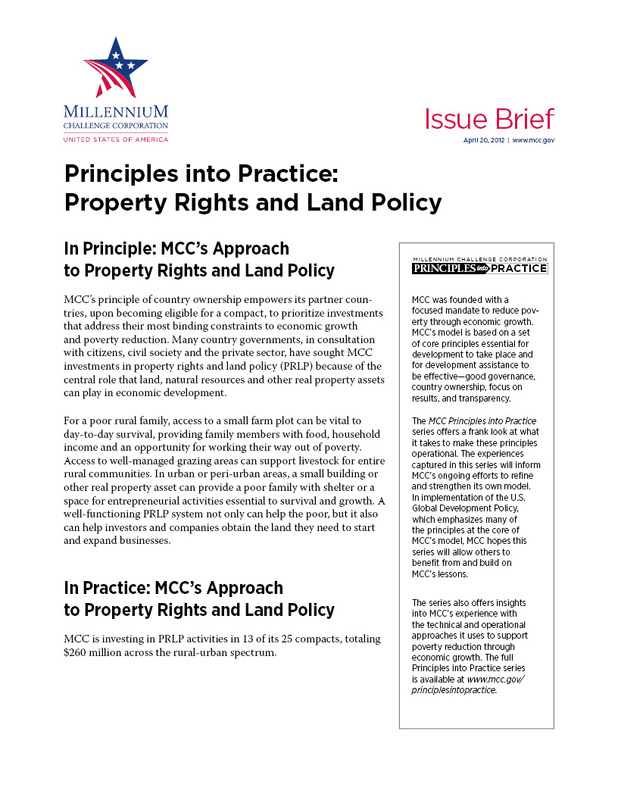 Many MCC partner countries have sought MCC investments in property rights and land policy because of the central role that land, natural resources and other real property assets can play in economic development. Country ownership embodies partnership, where countries consult with their citizens and civil society to design and implement programs within an MCC framework built on a focused mandate, accountability, transparency, and impact. MCC has set a high standard among the development community for its approach to results. MCC’s results framework reflects a commitment to technically rigorous, systematic and transparent methods of projecting, tracking & evaluating the impacts of its programs. The U.S.'s new Global Development Policy embodies a set of principles and practices at the core of MCC’s model. The United States’ new approach recognizes broad-based economic growth as the primary foundation for sustained poverty reduction.